UEFA would call an emergency panel of its executives to decide new qualification rules of Group B if Russia is thrown out, the governing body has told Business Insider. It gave Russia a suspended disqualification and a fine today for the behaviour of its fans during the England against Russia match in Marseille on Saturday. If Russian fans misbehave in any stadiums again, the team will be kicked out of the competition, UEFA says. How this “emergency panel” would decide on such a matter is unclear. 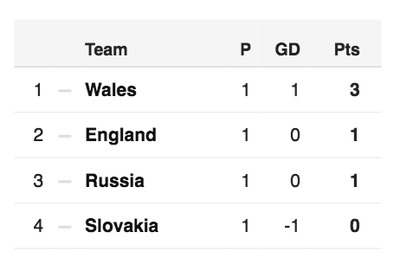 For Group B teams England, Wales, and Slovakia, the decision would be massively important. The 2016 European Championships are being played under a new format, where the top two teams from each group automatically go on to the next round, the last 16. An additional four teams who finish third in their groups and have the highest points total out of the third place finishers will also go through. Russia’s potential disqualification could make this already complicated system even more complicated. As far as Group B goes, if UEFA decided to throw Russia out before their match with Slovakia on Wednesday, a series of results could mean Slovakia and Wales finish the round with the same number of points. Say, for example England beats Wales on Thursday, and then Slovakia beats England on June 20, both Wales and Slovakia would have six points — having instantly been given another three each from Russia’s forfeited games. This is obviously unfair to England, who had to play Russia on Saturday and drew for just one point. Any decision UEFA could end up having to make in the wake of a Russian disqualification is likely to be controversial. Even if it says all three teams left in group B can go through, that is liable to be unfair to a third-placed team in another group who may have otherwise deserved to go through.